Ms. Reisdorff concentrates her law practice in the labor and employment arena in the exclusive representation of management. She advises and defends clients with regard to all aspects of the employer/employee relationship, including compliance with non-discrimination statutes, the FMLA, ADA, FLSA, NLRA, and state and local employment statutes. Ms. Reisdorff has assisted clients in proactively addressing issues involving the development of union-free operations, and the preparation of employee handbooks and procedure manuals. Ms. Reisdorff represents clients before the Equal Employment Opportunity Commission, the Department of Labor, the National Labor Relations Board, and in federal and state court. 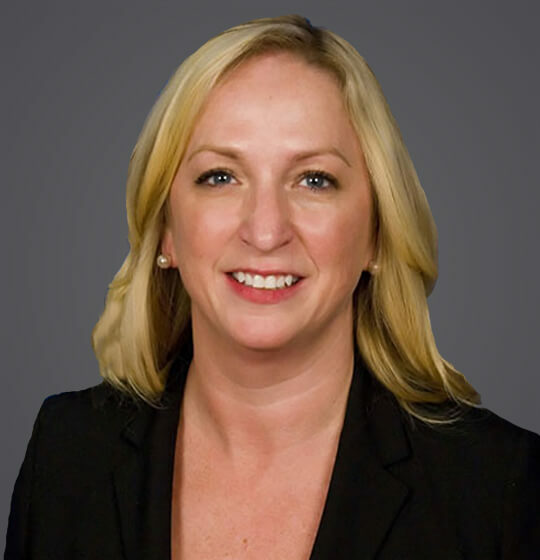 Ms. Reisdorff also devotes a significant amount of her practice to preventative training and counseling for supervisors and management for firm clients on a whole host of employment-law-related topics. Ms. Reisdorff’s corporate clients come in all shapes, sizes, and industries, and she takes pleasure in working with each of these organizations to make their facility a rewarding place to work. She is a sought-after speaker and moderator throughout the Midwest on labor and employment matters. Ms. Reisdorff received her law degree from the University of Nebraska, with distinction, and was an Executive Editor of the Nebraska Law Review. Ms. Reisdorff is extremely committed to the Kansas City Metropolitan Area and has made civic and charitable service a priority. She is a proud graduate of the Greater Kansas City Chamber of Commerce’s Centurions Leadership Program (Class of 2008). During her tenure in the program, she was elected to the Steering Committee by her fellow class members. Following her program graduation, Ms. Reisdorff has served on the Centurions Alumni Board and in 2009 she co-founded the Centurions Alumni Association’s annual golf tournament which benefits a local Kansas City charity each year. Ms. Reisdorff currently serves as a board member and committee chair for ImpactKC and was recently appointed to the Board of Directors, Ronald McDonald House Charity, effective January 1, 2015. For the past two years she has also served as an ambassador for the Kansas City Repertory Theatre’s annual gala. In the fall of 2009 Ms. Reisdorff was selected to participate in the FBI’s Citizen’s Academy, whose mission is to strengthen the relationship between law enforcement and the business community. She continues to participate in this program through its alumni association. For the past three years she has also served as a liaison for the United Way’s Small Business Annual Campaign. In 2008 Ms. Reisdorff co-chaired “Revolution,” an event benefiting the Salvation Army and in 2007 and 2008 was a committee member for the Kansas City Free Health Clinic’s “Bloom” party. In the 2012-2017 editions of Chambers USA, Ms. Reisdorff was named “Leader in Your Field.” The world’s best lawyers (i.e., those who perform best according to the criteria most valued by clients – such as technical expertise, business acumen, prompt delivery, and value for money) are identified and ranked by highly qualified researchers and Chambers editors. On the basis of this research, outstanding lawyers like Ms. Reisdorff are honored around the world. In 2014, Kansas City Business Journal named Ms. Reisdorff a NextGen Leader. Since graduating from law school, Ms. Reisdorff has devoted her legal practice to defending management in labor and employment matters. Ms. Reisdorff is also extremely committed to the Kansas City Metropolitan Area and has made civic and charitable service a priority. She is a proud graduate of the Greater Kansas City Chamber of Commerce’s Centurions Leadership Program (Class of 2008). During her tenure in the program, she was elected to the Steering Committee by her fellow class members. Following her program graduation, Ms. Reisdorff has served on the Centurions Alumni Board and in 2009 she co-founded the Centurions Alumni Association’s annual golf tournament which benefits a local Kansas City charity each year. Ms. Reisdorff currently serves as a volunteer and committee chair for ImpactKC and is a committee member for Ronald McDonald House Charities of Kansas City’s annual golf tournament. For the past two years, she has also served as an ambassador for the Kansas City Repertory Theatre’s annual gala. In the fall of 2009, Ms. Reisdorff was selected to participate in the FBI’s Citizen’s Academy, whose mission is to strengthen the relationship between law enforcement and the business community. She continues to participate in this program through its alumni association. For the past three years, she has also served as a liaison for the Untied Way’s Small Business Annual Campaign. In 2008, Ms. Reisdorff co-chaired “Revolution,” an event benefiting the Salvation Army, and in 2007 and 2008, was a committee member for the Kansas City Free Health Clinic’s “Bloom” party. March 8, 2018 - The Global Legal Post - "Helping women lawyers become top leaders"
October 7, 2013 - SHRM.org - "Employee Fails to Show Adverse Employment Action or Hostile Environment"
2011 - BNA Books (contributing author) - "How to Take a Case Before the NLRB"
December 2010 - Ingram's (Vol. 36, No. 12) - "An Ounce Of Training Is Worth A Pound Of Cure"
2008 - Missouri Bar Association CLE - "Missouri Employment Discrimination, Religious Discrimination"
August 15, 2016 - Golf Course Industry - "Against the Clock"